Blues rock, Garage rock a little bit of country and folk. 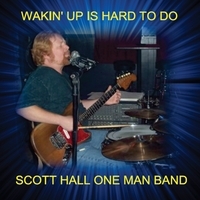 Guitar, Drums, Vocals, Harmonica, Kazoo Scott Hall does it all! With this long overdue debut album Scott Hall one man band sings some of his many songs about alcohol abuse and his ex girlfriends. Scott Hall has been performing as a "one man band" since 1984. Playing guitar and drums at the same time (using real drums), Plus singing and playing harmonica or kazoo while strummin' & drummin'. This long overdue Debut album is not for the faint of heart, featuring such immoral tunes as Pity the Sober, Dirty Dirty Girl and Two girls and a Box of Wine. Some of these songs will make you laugh, some might make you cry, the insane psychedelic guitar in Wyle E. Coyote may just twist your brain inside out. Pick up your copy of Wakin' Up is Hard to Do today, you never know Scott may just be "Your Real Dad". But what ever you do don't play it for grandma!